Aquarius has so often been associated with knowledge, innovation, future technology and in recent times, computer science. 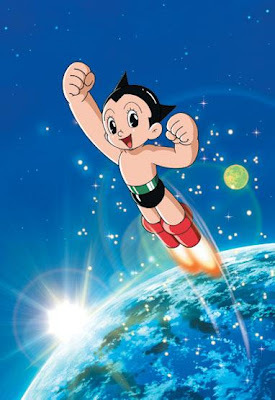 For me the icon that comes to mind when I think of Aquarius is that fantastic figure, Astroboy. Quirky... Yes. That's another thing you can say about Aquarians! My version of Aquarius may be more feminine than Astroboy but there are similarities between the two. I've placed her in a foreign planetary landscape denoting space travel and given her fiery red leather boots that even Astroboy would covet in lieu of his jet-propelled shoes. This hot lady's boots are like the seven mile boots owned by the giant in Jack and the Beanstalk. Aquarius can use them to leap up into space or travel wherever she chooses, leaping seven miles (or seven hundred miles!) with every step. There's really nowhere this pioneer will not go which is just as well because Aquarians enjoy travel and expanding their minds. Aquarius has just landed and is holding a pack of cards and a knife. Whatever for? Well it's worth looking at other aspects of this sign. Aquarius is linked with anything new and avant-garde. Natives can be eccentric because they are true visionaries who are not limited by standards and commonalities. They can seem out of touch or aloof to others and their humour is sometimes offbeat. So that explains the knife and the cards which are an odd combination. Yet there is another explanation...the Aquarian ability to see far into the future well before others can and to implement the new, denote their inherent clairvoyance. Aquarians can see trends before others can and are always one step ahead. This Aquarian lady is in fact a space travelling gypsy. 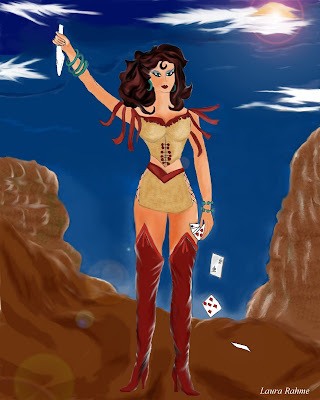 Her fortune telling cards are symbolic of her clairvoyant qualities. Continuing with the gypsy theme, I've given Aquarius dark Iberian features and equipped her with a stabbing knife à la Carmen. Notice she holds the knife high and points it away, towards the ground. Will she drop it like she does with the cards? Probably. Aquarians are true humanitarians. They usually show tolerance for others and have a deep understanding of the variety in human nature and cultures. I couldn't see my Aquarian lady using that knife.